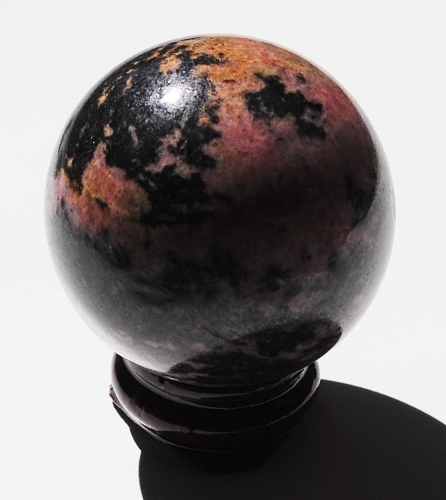 Gorgeous dusty rose pink with dark grey mottled pattern Polished Rhodonite Crystal Sphere from Madagascar, Africa. Rhodonite provides emotional balance while nurturing feelings of love. 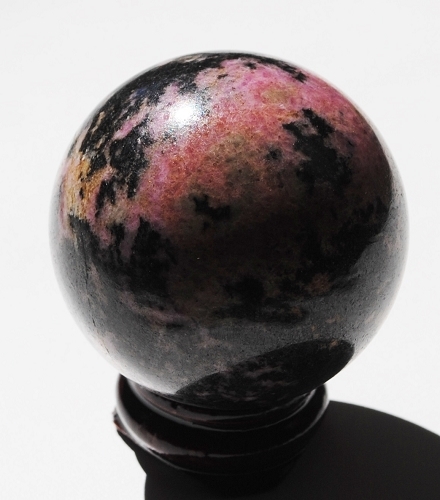 With its mellow energetic vibration, Rhodonite offers a softened, flexible approach to receive and give love. Rhodonite has been called the “stone of love” and helps one to achieve ones greatest potential. Rhodonite brings truth and love together in mutual acceptance. Rhodonite creates a sense of flow through understanding, acceptance, and encouragement. The feelings and expressions of Love are offered with harmony with the support of Rhonodite. Rhodonite’s energetic vibrations help to expose veils of illusion and fear, transforming resistance into willingness, so that one may acknowledge and share one’s heart truth and hidden gifts/talents with others. 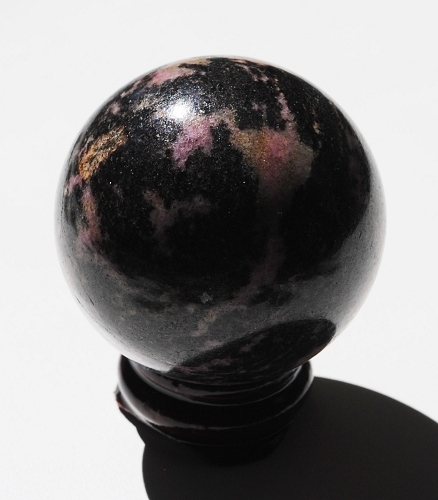 Rhodonite’s energetic vibrations help to overcome the separation of different points of view. Rhodonite prevents retaliation and shows one that revenge is a self-destructive response. Rhodonite polarizes feminine energies to attract warmth, kindness, acceptance, respect, honesty, joy and PEACE within self and the surrounding environment. Rhodonite polarizes masculine energies to radiate outwardly through hope and generosity. The energetic vibrations of compassion and harmony flow softly back and forth between Rhodonite and any person affected by this stone. Having a strong resonance with forgiveness, Rhodonite is beneficial for emotional, past-life healing and in overcoming issues of abandonment, betrayal, self-destruction, codependency, and abuse. In healing, Rhodonite contains manganese which makes it an excellent wound healer, as well as, helping to relieve itching from insect bites. Rhodonite beneficially affects bone growth and fine-tunes auditory vibrations for better hearing and to relieve tinnitus. Rhodonite may stimulate fertility. Rhodonite strengthens tissues, organs and glands. Rhodonite treats emphysema, inflammation of joints, and arthritis, autoimmune diseases, stomach ulcers, and multiple sclerosis. Rhodonite may be used as elixir as a “rescue remedy” in a situations of shock or trauma. Rhodonite is supportive of the liver during detoxification. Rhodonite helps to stimulate the metabolism and increases energy and vitality. Sphere emits equal energy in all directions and has been used as a window to the past or future. Sphere move energy through time and provide a glimpse of what is to come or what has been, this practice is called scrying.